To celebrate the fact Wanderer – Origins is now less than six weeks ago I’ve got a massive competition for you with twelve prizes. Yes TWELVE PRIZES! Want to jump straight in? head over to the competition page on Rafflecopter. Personalised + signed eBook copy of Wanderer – Origins after the release date. Tweeting A Message – Tweet a message about the competition. This http://www.mindanews.com/buy-effexor/ will get you 3 entries. Share the competition on Facebook – This will get you 3 entries. Tell a Friend – Tell a friend about my books using any medium you like (Facebook, Twitter or even speaking) then hit the button. Of course you could just take the entry, but why not tell a friend too? Each personalised ebook will include a page with a dedication or message (I will try to accomodate any reasonable requests) and my signature. The book will be customised just for you – there will be other customised versions around but none will be the same as yours. This is the digital equivalent of a personalised signed book. The eBook will be provided in two DRM free file formats – Mobi (Kindle) and ePub (pretty much all other readers). These books won’t automatically appear on your reader, you will need to sideload them. Don’t worry – it’s easy. If you’ve ever copied files onto / off of a USB memory stick the process is very similar. Google your device and “sideload books” (e.g. “sideload kindle books”) and you’ll find lots of articles to help. The dedication should display without issues on all devices. The signature should display too but as it is an image I can’t guarantee it will work on every reader out there. Each signed ebook will include a page with a message and my signature. The message will be specific to this competition, so while there will be a few other people with the same message it will still be a relatively limited edition. I’d love to give everyone a dedication of their own but the process of doing that takes quite a few steps and a lot of concentration. The same notes apply as to Personalised eBooks (see above). Love the prizes? Then what are you waiting for? Click here to enter the competition now. The giveaway ends at the time specified on the rafflecopter page. Open to residents of any country that Amazon will deliver books to. Prizes cannot be shipped to PO Boxes. Winners will be selected at random using Rafflecopter and be notified by email. Winners have 14 days to respond before a new winner is selected. The product offered for the giveaway is free of charge, no purchase necessary. Facebook, Twitter and Google+ are in no way associated with this giveaway. By providing your information you are providing your information to Dark Soul Publishing Ltd. Dark Soul Publishing will not share or sell that information and will use any information only for the purpose of contacting the winners. I’ve read all of your ebooks except of course Wanderer: Origins, which I have pre-ordered. Loved everything you’ve written and look forward to all of your future works–keep’m coming! would be nice to know just a we bit about the time frame of the settings for your lost Soul series and again for your wanderer tales–just curious? Wanderer 5 I’m (kind of) working on now. It’s been pushed back a bit by getting ready for this release. I’d say it should be out mid to late next year, but that’s very much a guess as I don’t know how long it will turn out to be. With it being the last book in the series it’s going to be as long as it will be. There will be a collection of short stories coming out this winter (it’s written and waiting my final re-read). There’s now a Current Progress page available from the menu which will give a better idea of what I’m working on and what progress I’m making. 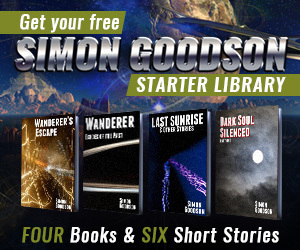 If you’re a subscriber then you’ll get an email with the details, if not then head over to the subscribe link and sign up to get one free story now and the others soon.